I know many people think that everyone who chooses to homeschool knows what they are doing and everyday is full of laughter. I just laughed at myself for that previous statement. We have been homeschooling for almost 6 years, and I still wonder why I haven't lost my mind. I am very used to have a challenge thrown at me daily. But is there an easier way to homeschool without going crazy? Stephanie Walmsley has created the Successful Homeschool Made Easy system to help out old and new homeschooling parents. Successful Homeschooling Made Easy Course is a 26 week course in which parents get a weekly PDF lesson that shows them how they can better plan out their homeschool schedule with their work schedules and other commitments. It's is available for the low cost of $10.00 a month (for 5 months) or a one time payment of $48.50. Stephanie not only talks schedules and organization, but how you can get deeper into subjects including reading and math. She also really gets you to look at why you want to homeschool and what you want to accomplish from homeschooling your children. Her lessons cause you to sit down and really think about what you want to teach your children. You can use Successful Homeschooling Made Easy Course, even if you are a veteran homeschooler. Maybe you need some help establishing a more set schedule and not sure where to turn. Messes are normal in every home, but maybe you are completely overwhelmed by the mess that accumulates daily. Or you might need help choosing a curriculum or schooling style that will fit your family. These are just a few of the topics that will be covered in this 26 week course. If you are a family that unschools, then you may not find the planning part of Successful Homeschooling Made Easy Course helpful to you. She does encourage seat work for the students, and we do bookwork, but not the way that Ms. Walmsley suggests. I also have four different personalities to deal with in our kiddos, which most people do also. The kids do not always work well together. In one of the first lessons, it asks you to look at each personality and see when they work better. Do you work better in the morning or afternoon? This is one area of planning that we are still struggling with, but working on trying the new suggestions. Successful Homeschooling Made Easy Course is causing me to rethink my schedule and causing me to get a lot more organized. Since I work almost full-time from home plus homeschool, the house was really starting to get overrun. I have a ways to go, but just starting a few suggestions has helped take off some of the stress that I have been feeling about the mounting mess around me everyday. When you homeschool, everything in your life is intertwined. If I work over and have extra work, it affects the amount of time I have for homeschooling the kids. If we have extra projects or a field trip, that affects my work time and when I can work. This in turn affects the amount of time I can spend with my husband in the evenings or the time that I have to get up in the morning. This affects my sleep, which then affects my health. Teaching chores as school never really came to me. (Blame it also on my Type A Personality). But I really love that suggestion. This type of "schoolwork" doesn't take long, and really if you think about it, it's taught in public schools also. Cleaning/wiping tables, sweeping up messes in the classroom. It's part of a child's day in public school also. So chores and cleaning become part of our own daily schedule is not different as homeschoolers. Since I am a parent of special needs children, this also presents a few more challenges. So some of the suggestions will not work for our kids. But what I have found so far, is that we will continue to benefit from using Successful Homeschooling Made Easy. Each week's PDF lesson is delivered in my email weekly, and really doesn't take long for me to read through, but really gets me thinking about how I can improve myself and the various areas of our life to help with stress. You can easily print them off and keep them in a notebook. There is plenty of room on each page for me to make notes and work on how to implement the suggestions in our home. I do really like that she refers to practical skills in many of the lessons. I am a firm believer in really teaching the kids practical everyday life skills. In fact this is very important for our older boys who have enough hurdles to overcome. I look forward to each weekly lesson, and look forward to those that are still coming. 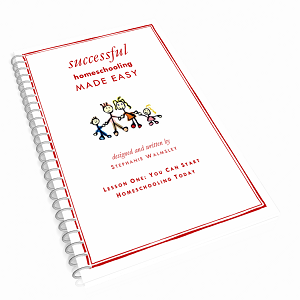 Successful Homeschooling Made Easy Course is great for those who are just starting but also a great refresher for veteran homeschooler who need a little help remembering where they wanted to be. Several members of the Schoolhouse Review Crew were given the opportunity to try out Successful Homeschooling Made Easy Course in their homes also. Still not sure if it's a fit for you, visit the Schoolhouse Review Crew blog to see how others used it in their homes.